Camille Pissarro, Boulevard Montmartre, Spring (1897), oil on canvas, 65 x 81 cm, Israel Museum, Jerusalem. WikiArt. In the first article of this series, I showed what I mean by series paintings, defined some sub-types, and considered how and when they came about. The second article then examined Pissarro’s series paintings, but without the benefit of the current catalogue raisoné, and the fifth summarised my findings and thoughts. This article summarises the information that I have now obtained from working through that catalogue raisoné. Numbers given below are reference numbers in that catalogue. Camille Pissarro, some of the road at Louveciennes series painted between 1869 and 1872. Several of his road views from Louveciennes might amount to short and loose series, but were scattered, and there is no evidence that he intended them to form a series. Given the large number of road paintings from that period, this may well be chance, as I previously suggested. During the 1880s, he did show signs of repeating motifs and compositions in some paintings: for example, 752 and 753, 754 and 758, 781 and 784, all painted in or near Éragny in 1884. The paintings from Rouen in 1883 do not meet my criteria for a series. Camille Pissarro, View of Bazincourt, Sunset (1892), oil on canvas, Private collection. WikiArt. However he started painting repeated views of the same motif as early as 1887, of Bazincourt, which form part of the very large and branched series he undertook there from 1887 to 1899. Among these is one branch of at least 43 paintings of a view of Bazincourt which generally includes the church spire and poplar trees, starting with 839, 841, 863, 864, 880, 879, 899, and concluding with 1238, 1239, 1242, and 1271. Other interesting branches which I can see in that overall huge series include the large Walnut tree (e.g. 924, 925, 926, 929, and 979), and some of the Epte floods (e.g. 977, 978, 979). Camille Pissarro, a tiny sample of the many paintings in his Bazincourt series, circa 1892-4. That large Bazincourt series requires more careful study and analysis, but it is notable that it was started well before Monet’s first tight series, of La Vallée de la Creuse in 1889. It could not therefore have been a response to Monet’s first commercially successful and tight series from then onwards. The next formal series painted by Pissarro was not until 1896. Brettell and Pissarro’s claim that he did so in 1893 around Gare Saint-Lazaire in Paris is not borne out by the evidence, at least as far as my definitions are concerned, although one of the paintings from that period augments a series of 4 which he painted there in 1897, making it a short series of 5. Le Havre, a branched series of 23 paintings completed shortly before his final illness in 1903, starting with 1504. This differs slightly from the estimates of Brettell and Pissarro, which were made before the publication of the catalogue raisoné, and in the absence of my rigorous definitions. 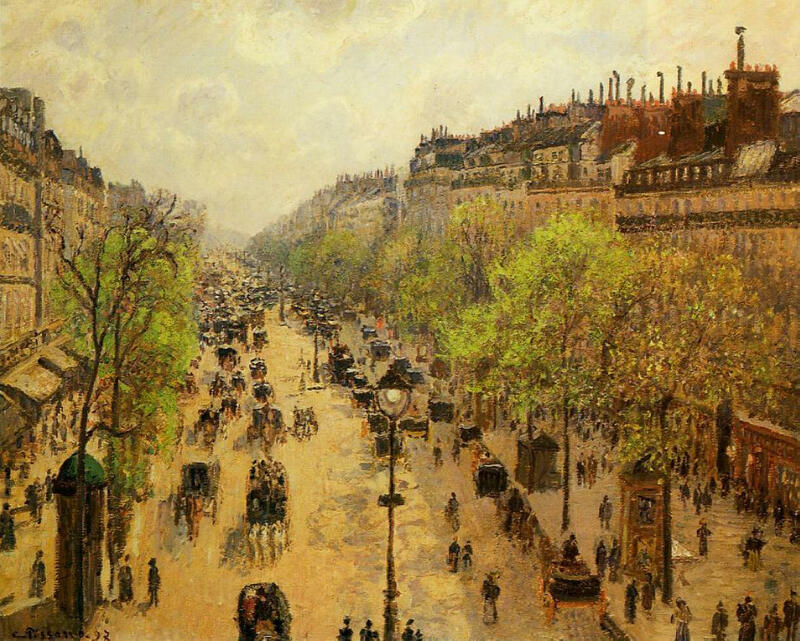 Camille Pissarro, some paintings from the Avenue de l’Opera series, 1898-9. Over that period, assuming the catalogue raisoné to be complete and correct, the above series account for a total of 231 of his 544 paintings (42% of his work in oils). From 1900 until his death in 1903, a period in which he painted 229 canvases, 133 (58%) were members of series. I now think that it is fair to assume that Pissarro, as well as Monet, started series painting independently and prior to the commercial success enjoyed by Monet around 1890. 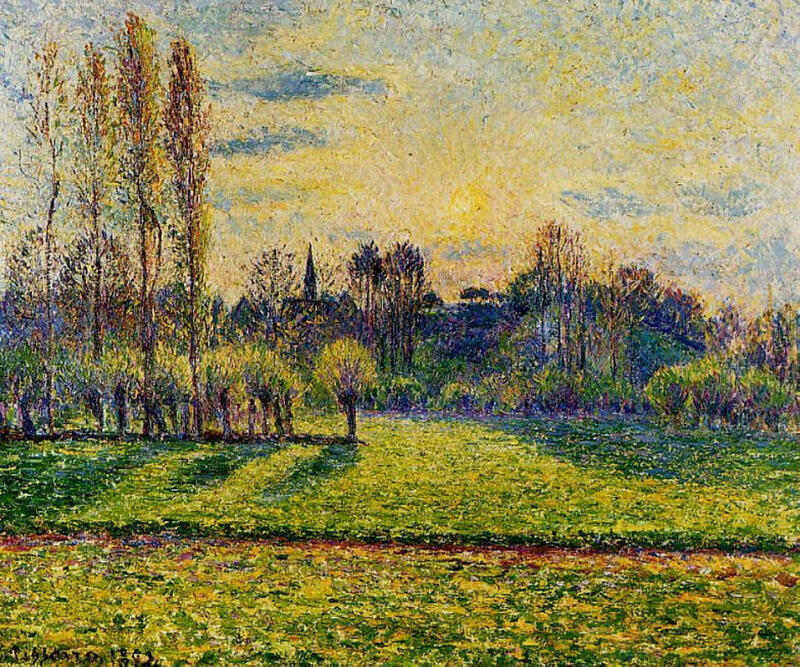 However Pissarro did change to painting mostly in series during the final years of his career, most probably as the result of Monet’s success with the Grainstack series. More thorough analysis of his paintings from near Bazincourt in the late 1880s is also needed. Otherwise my conclusions stand as stated in the last article. Posted in Painting and tagged cityscape, Impressionism, landscape, Monet, Pissarro, series. Bookmark the permalink. Q&A: Please may I Trash this?